When we had Cronut, Kouign Amann, Chilly Penguin Religieuse, we also had Perfect Little Egg Sandwich at Dominque Ansel Bakery. I saw this product on Instagram and as it doesn't contain mayonnaise, I decided to try though I don't like eggs that much these years except when it's mixed or egg white only. It's a warm dish served all day. 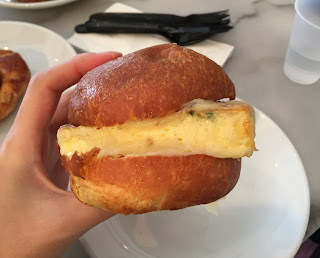 Steamed, fluffy, farm fresh eggs with herbs, shallots and Gruyere cheese on a homemade mini brioche bun. It has "VG" at the end, it's vegetarian I bet. Once the order was placed, they placed the pre-cooked square egg and cheese on a metal plate, then heated in the oven. When the timer went off, they added a halved brioche next to the egg and cheese, and once they're all warmed up, it's ready. Brioche had nice golden brown color, and Gruyere cheese was melted thinly over the fluffy egg. When I saw the photo on SNS and on the glass wall, I thought this sandwich will be "little" as it's named, but the diameter was as large as about a half of my hand, which is about 18cm (7.08 inch). 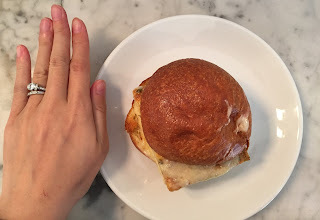 When I flipped the brioche, melted cheese came off by sticking on the bun. The surface where the cheese was applied seemed to be sprinkled with herb or parsley. Because the brioche was tall and the egg was so fluffy, this sandwich was very tall as if it's a hamburger with a thick patty. 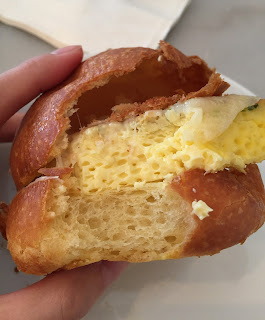 The upper half of the brioche was pretty much hollowed out, and when I bit, it made crispy sound and fell apart. The bottom half was moist and soft, and the surface was light and crispy. The egg was "air-filled omelette," I'd describe, and shallots and herbs were lightly used and it tasted simple. As a cheese lover, the amount of Gruyere they put was too little and the flavor was hidden by the fluffy egg and butter-rich brioche. It's named "little" but a fulfilling sized and flavored sandwich. Cronut "Cherry Blossom Ganache and Sour Cherry Gelée (with citrus sugar)"
Cronut "Rum Caramelized Banana Brown Sugar"
Cronut "Lychee Rose Jam and Pistachio Ganache"